UltraGuage is an Automotive information center and Scantool. 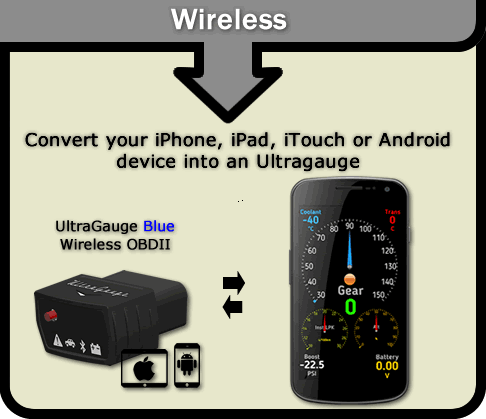 Ultragauge is available in both wired and wireless versions. Please select the large Wired or Wireless Buttons above to visit the dedicated webpage for each. To learn about the key differences between the wired and wireless versions, please click the "Help Me Choose" button above. UltraGauge EM Plus: Wired product optimized for plug & play simplicity. 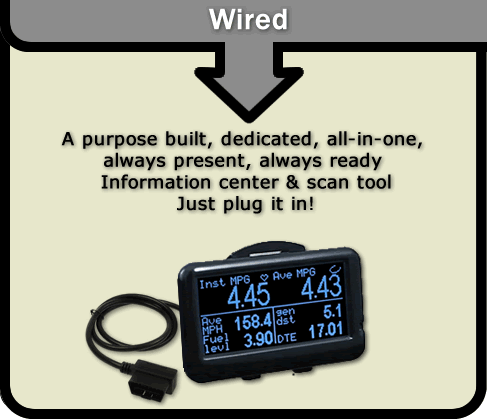 UltraGauge is commonly referred to as an auto scanner, obdii scanner, OBD2 scanner, car scanner, code reader, code scanner, car code reader, trouble code reader, check engine light reader, diagnostic code reader, mileage gauge, MPG gauge, miles per gallon meter, MPG calculator, bluetooth receiver, bluetooth dongle, bluetooth adapter, obd2 adapter, obd2 bluetooth, obd2 scanner, obd scanner, obd ii scanner, scan tool, scan gauge, auto diagnostic, digital gauge, auto gauge, etc.